Today's featured photo, Lake Placid's own Bullwinkle moose, was caught on a motion-sensor trail camera one night earlier this week. He is pictured trolling through the very same neighborhood where our friend Vanna the Mount Van Hoevenberg Moose was seen last spring. His stroll also took him close to a favorite spot of the Cascade Cow Moose. This makes perfect biological sense because, according to the resident biologist, this is the time of year for amorous moose mien. In other words, they are in the rut. At the risk of being accused of rampant anthropomorphism, I hope the boy moose finds the girl moose(s) so we have an opportunity to see a cute baby moose or two. When I excitedly quizzed Ed about the chances of having a local moose nursery, he calmly explained of course there will be babies. The Adirondack Moose Whisperer says the Adirondacks have had a breeding moose population for at least the last 20 years. As a matter of fact, after much sophisticated and thorough analysis, he recently increased his Adirondack moose population estimate to approximately 800. Ed says moose population growth will be exponential and we can look forward to more frequent moose sightings throughout the Adirondacks. Perhaps there will be a baby moose or two in the neighborhood next year! Today's Carousing Moose photograph courtesy of Sue Cameron. 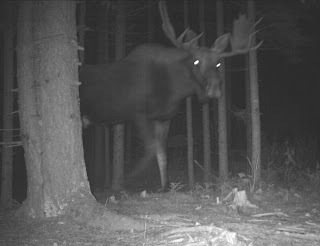 Is that the legendary "devil moose?" Yes it is - do you know him, or only of him? !